Unniappam: Unniappam is a popular snack in Kerala. In Malayalam, unni means small and ‘appam means rice cake. Unniappam is a small round snack made from rice, jaggery, banana, roasted coconut pieces, roasted sesame seeds, ghee and cardamom powder fried in oil. Variations of the unniappam, using jackfruit preserves instead of banana is also common. Dry roast the sesame seeds. Heat a drop of ghee and roast the coconut pieces. Boil the water with grated jaggery, till it becomes thick. In a mixing bowl, add the rice flour, semolina, green cardamom powder, roasted coconut pieces, chopped banana and roasted sesame seeds. Add in the jaggery syrup. The batter should be in dosa batter consistency (if needed add little water). Keep aside for at-least an hour to ferment. Heat up the paniyaram/ unniappam kadai and then grease it with oil. Once the kadai gets hot, add a tbsp of batter in each hole. Drizzle little oil on the side for each unniappam, cover and cook it. Once the unniappam starts turning brown, use a spoon to turn to the other side. Cook for few seconds and take it out. 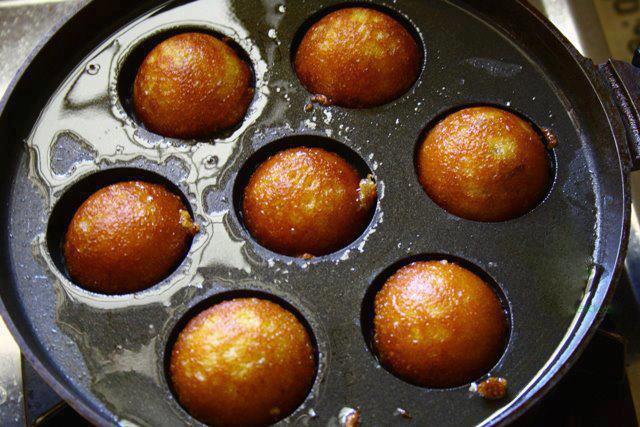 Unniappam’s are ready to be served. I used paniyaram/ unniappam kadai to make unniappam, you can deep fry the unniappam also. If you have any queries regarding the Unniappam recipe, please leave a comment.